A synergistic blend of Jasmine and Geranium with hints Cape Camomile captured in a luxurious 4 piece selection catering for every at-home-spa need. Whether it’s drenching your body in a luxurious Marula oil bath milk or lavishly coating dry skin with vitamin infused butters, every product is carefully selected to achieve optimum relaxation – the key to a peaceful mind, body and soul. Description: A silky textured soothing botanical synergy body oil which helps relax the senses and create a sense of harmony of the body and mind while providing a gentle sedative effect. Important Ingredients: Marula Oil, Jasmine, Geranium. Description: Mineral rich sea salts, containing a powerful blend of relaxing essential oils is complimented with dried Rose petals for the ultimate de-stressing bath experience that leaves you feeling relaxed and physically and emotionally balanced. Important Ingredients: Atlantic Sea Salts, Geranium, Jasmine. Description: A natural, luxurious bath milk with optimal moisturising benefits infused with anti-ageing benefits and a traditional herbal tranquility blend to help soothe the senses and deeply hydrate your skin. Directions for use: Add to a running bath of water. Lie back, relax and deeply inhale the aroma. With the setting of the mesmerising African sun a new journey awaits your weary body. 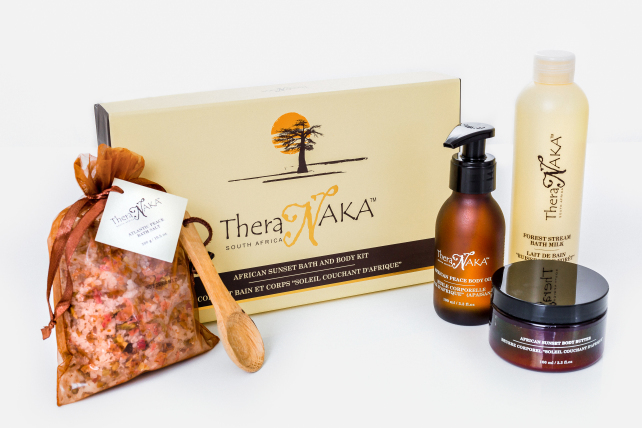 The TheraNaka™ African Sunset Bath and Body Kit offers a sensational selection of relaxing body care favourites, complimented with an abundance of aromatic scents and natural infusions with reputed healing properties.